It's almost that time of year when children dress up in costumes and run through the streets, the air filled with laughter and screams as they fill their bags with trick or treats. I remember years ago (and no I won't say how many) heading out with my pillowcase in hand and my black and orange UNICEF box in the other. I would gleefully collect candy for myself and spare change to help others in lands far away. Over the years, this program continued but time brings change and this Halloween when you answer your door you won't see the familiar orange box but that doesn't mean you can't help. If you have school aged children there are new ways for them to join Team UNICEF in raising funds. Visit the website for details on how to get involved. October 31st is still National Unicef Day and there are lots of ways you can get involved, don`t worry I`ll get to those but first I want to share a story. Recently I attended the Blissdom Canada conference and was fortunate to have an opportunity to spend some time with one of the representatives of UNICEF who took me around their "room" and explained what UNICEF Canada is doing today and how they make a difference. I was given the opportunity to taste the Plumpy Nut therapeutic food that can help a malnourished child gain up to 2lbs in a single week. I saw the products that help prevent disease, improve quality of life and in some cases life saving essentials that we take for granted on a daily basis. As I toured around, I certainly felt sadness for the situation and thought about how I could help but all in a superficial kind of way - it's not that I didn't care but emotionally it hadn't struck a chord. Right about now I probably sound like I could give the Grinch some competition. While I truly felt like the work UNICEF is doing is worthwhile and the cause is one of need, it fell into the category of humanitarian and important causes that I wished I could support (and if I win that lottery I assure you, I will). As we passed by the area dedicated to supplies for children like the "School in a box", "Art in a box" and Early Childhood Development Kit, I thought about how fortunate my daughters are and how little it takes to help a child in need and what an amazing job UNICEF is doing but still no stab at my heart that would spur me to action until....we passed a wall with artwork from children from impoverished and war torn countries and as I looked at the drawings and paintings I started to cry. 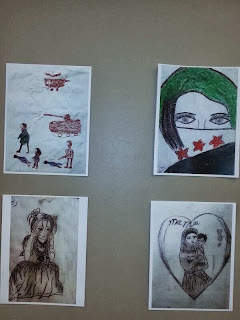 I've always felt that art was a great way to communicate when words sometimes were too hard or too difficult to articulate and as I`ve talked about often, my daughter frequently expresses both her joy and her unhappiness through art. Embarrassed I wiped away my tears but the damn things kept coming, so there I was trying to have a mature conversation as I blubbered away. The UNICEF rep was very kind and talked about how different people are affected by different things in different ways (I guess my go to is sobbing). When I looked at those drawings it was like those children were reaching out to me and the effect was both unexpected and disarming. So now the question is how do I make a difference? Well I start by spreading the word, to family, to friends and through my social networks. I signed up for the 1 email = 1 vaccine campaign, I`m writing a blog and I believe at only $32.00 there is the gift of Art in a Box in our future. Now it`s your turn, there are many ways to help that don't cost a thing thanks to generous sponsors like Hallmark and others. Start by providing your email address to the 1 email = 1 vaccine campaign. From October 11 to October 31, everyone who provides their email and phone number to UNICEF Canada through unicef.ca will provide 1 life-saving tetanus vaccine to a child, thanks to the generosity of their partners. Every email counts. If you are a blogger, write a blog about the Give the Gift of Life Campaign. UNICEF is working with Hallmark Canada to provide 10 vaccines for every blog post written in support of our Likes Don’t Save Lives, Survival Gifts Do campaign. 1 blog = 10 vaccines. Purchase a Survival Gift for as low as $10 (you probably spend more than that in coffee in a week) you can make a difference. I hope that my blog inspires you to help and find what touches your heart and makes a connection with those in need. If you need a little more inspiration listen to Nigel Fisher and find out about his boots featured on cover of this years Survivor Gifts catalouge. Great post, Linda! You got to taste a Plumpy'Nut?! I'm ALL about the Plumpy'Nuts this year - we bought 22 packs instead of a hostess gift for a Hallowe'en party tomorrow night! I had a moment in the Unicef lounge at Blissdom, as well. It was those water jugs. Imagining my 7 year old daughter NOT going to school but lugging 2 of those (ridiculously heavy) for several hours every day just broke my heart. The folks at UNICEF did a great job at letting us discover the message we needed.